Abstract. N2O is currently the third most important anthropogenic greenhouse gas in terms of radiative forcing and its atmospheric mole fraction is rising steadily. 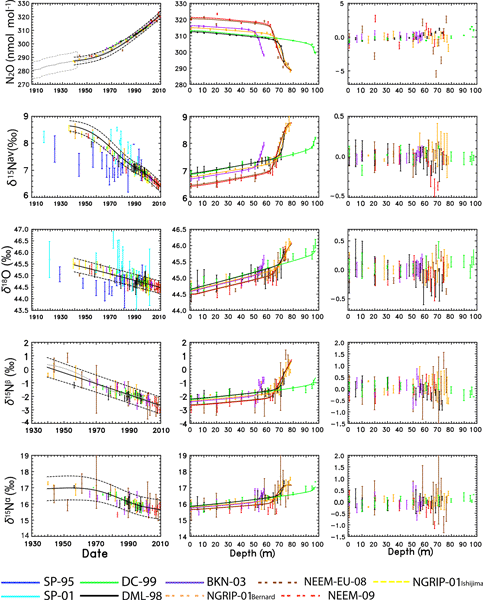 To quantify the growth rate and its causes over the past decades, we performed a multi-site reconstruction of the atmospheric N2O mole fraction and isotopic composition using new and previously published firn air data collected from Greenland and Antarctica in combination with a firn diffusion and densification model. The multi-site reconstruction showed that while the global mean N2O mole fraction increased from (290 ± 1) nmol mol−1 in 1940 to (322 ± 1) nmol mol−1 in 2008, the isotopic composition of atmospheric N2O decreased by (−2.2 ± 0.2) ‰ for δ15Nav, (−1.0 ± 0.3) ‰ for δ18O, (−1.3 ± 0.6) ‰ for δ15Nα, and (−2.8 ± 0.6) ‰ for δ15Nβ over the same period. The detailed temporal evolution of the mole fraction and isotopic composition derived from the firn air model was then used in a two-box atmospheric model (comprising a stratospheric box and a tropospheric box) to infer changes in the isotopic source signature over time. The precise value of the source strength depends on the choice of the N2O lifetime, which we choose to fix at 123 years. The average isotopic composition over the investigated period is δ15Nav =  (−7.6 ± 0.8) ‰ (vs. air-N2), δ18O  =  (32.2 ± 0.2) ‰ (vs. Vienna Standard Mean Ocean Water – VSMOW) for δ18O, δ15Nα =  (−3.0 ± 1.9) ‰ and δ15Nβ =  (−11.7 ± 2.3) ‰. δ15Nav, and δ15Nβ show some temporal variability, while for the other signatures the error bars of the reconstruction are too large to retrieve reliable temporal changes. Possible processes that may explain trends in 15N are discussed. The 15N site preference ( = δ15Nα − δ15Nβ) provides evidence of a shift in emissions from denitrification to nitrification, although the uncertainty envelopes are large. How to cite: Prokopiou, M., Martinerie, P., Sapart, C. J., Witrant, E., Monteil, G., Ishijima, K., Bernard, S., Kaiser, J., Levin, I., Blunier, T., Etheridge, D., Dlugokencky, E., van de Wal, R. S. W., and Röckmann, T.: Constraining N2O emissions since 1940 using firn air isotope measurements in both hemispheres, Atmos. Chem. Phys., 17, 4539-4564, https://doi.org/10.5194/acp-17-4539-2017, 2017. Nitrous oxide is the third most important anthropogenic greenhouse gas with an increasing mole fraction. To understand its natural and anthropogenic sources we employ isotope measurements. 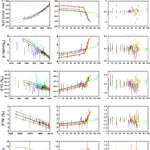 Results show that while the N2O mole fraction increases, its heavy isotope content decreases. The isotopic changes observed underline the dominance of agricultural emissions especially at the early part of the record, whereas in the later decades the contribution from other anthropogenic sources increases.